52 Quilts in 52 Weeks: It's Spring! Time for a new "Block a Day" project! The BaD for Spring is one of the simplest blocks in the quilter's canon. And there's a story why I chose it. And what could be more traditional than the Friendship Star? I promise you, the dark is purple, not brown! 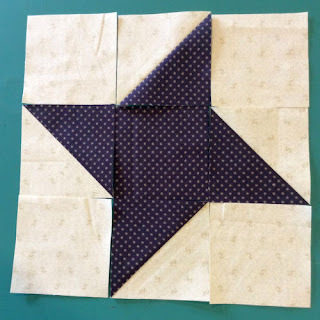 This block is so easy, I'm almost embarrassed to offer a tutorial! But just in case you've never made one, here's how I made my 9" finished block. 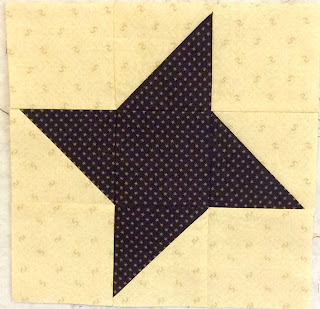 To make the Friendship Star block, you need four background squares, one center (contrast) square, and two half-square triangles made from the background and contrast fabric. My un-pieced squares are cut at 3½" and the HSTs (Half Square Triangles) start out as 4½" squares. 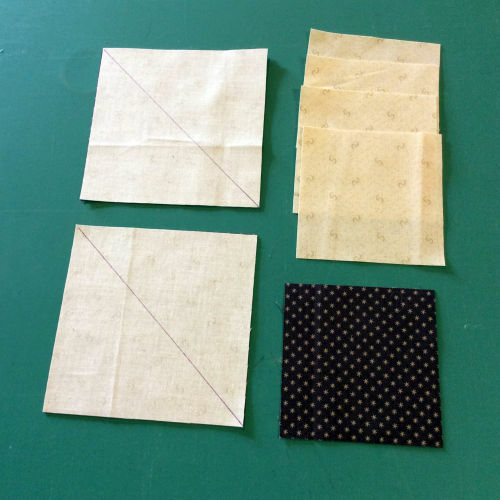 Make your HSTs by whatever method you like best. 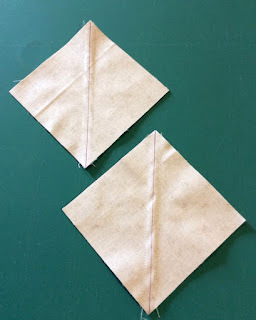 I'm using the "draw a line from corner to corner, stitch ¼" from either side, cut in half on the line, and press toward the dark" method. 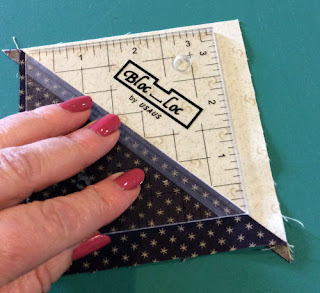 I do love the Bloc_Loc rulers to square up HSTs. This one makes perfect 3½" HSTs. If you've never tried this nifty tool, here is a link to my post describing how to use it. Stitch them together and press. I press the horizontal seams outward, and the vertical seams inward. 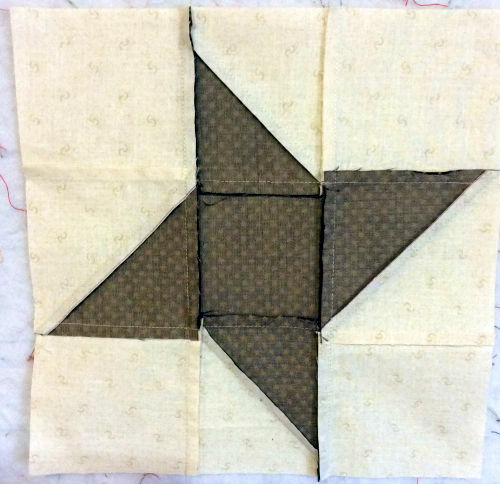 That way, when I sew all the blocks together, the seams will nest nicely! Presto! One down, 89 to go! Going to be a lovely quilt in shades of purple. Hello Marti, nice to have you back and thankyou for this tutorial. I was very excited recently when an elderly friend passed me a box of random fabric and quilting notions. Amongst those were 2 packs of Marti templates B and D. I am planning to make some blocks from the enclosed leaflet, but I understand there was a book to go with them? Hi, Marti! How's the Quilt shop job?